A group of 9 British and Norwegian passengers have begun legal action against Airbus and Aero Engines, after the BA plane made an emergency landing at Heathrow in May. The flight to Oslo had to make an emergency landing, soon after take off, as the engine covers few open and fell off during take-off. The cover on the right engine split a fuel pipe on the engine which subsequently caught fire. The plane flew back with an engine burning, right across London, but landed safely and though passengers had to use the emergency shutes, no-one was hurt. The covers had not been closed and locked properly following maintenance checks the night before. The 9 passengers have now filed a complaint in the US saying that they have suffered severe psychological trauma as a result of the emergency landing, which has affected their personal and professional lives. There have been more than 30 other cases when engine covers have not been closed properly. It is likely that there will be more passengers joining the claim, which could total $25m. A group of nine British and Norwegian passengers have begun legal action after a British Airways plane made an emergency landing at Heathrow in May. Flight 762 was bound for Oslo in Norway with 75 passengers on board when the engine covers fell off during take-off. One of the covers split a fuel pipe on the right hand engine which subsequently caught fire. 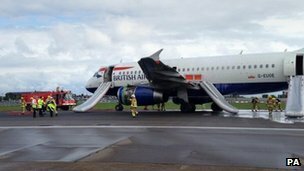 The plane turned around and landed safely, after which everyone left down the escape slides. No-one was hurt. According to an interim report by the Air Accidents Investigation Branch (AAIB), the covers had not been closed and locked properly following maintenance checks the night before. The AAIB urged airlines and pilots to double-check their planes before take-off. Nine people have now filed a complaint in the US saying that they have suffered severe psychological trauma as a result of the emergency landing, which has affected their personal and professional lives. Law firm Stewarts Law LLP, which is representing the passengers, claims that in the past, there have been more than 30 other cases when engine covers have not been closed properly. One of those on board, Alexandra Townsley, told lawyers: “It was absolutely terrifying. My sister and I had a clear view of the engine fire. I remember thinking to myself that I was going to die. The legal action is against Airbus, which made the aircraft, and International Aero Engines, which made and sold the engines. It is not, however, against British Airways, despite the fact that it was their plane. I am told that more passengers are likely to join this claim, which could total $25m (for a bit of context, I understand the Asiana accident in San Francisco recently could end up in a claim for $250m). But there is a long way to go yet. It could be many months before we get the final report from safety investigators detailing exactly what went wrong with Flight BA762. Airbus said it did not comment on litigation matters. Posted: Friday, July 12th, 2013. Filed in General News, Recent News.